18.02.2019 • Some corrections have been made with take off flaps settings. It is now possible to use 20 or more degrees flap settings on take off, besides, the flap recognition problem which was seen with some Airbus models, have been found and corrected. • Some improvements with data surveillance over vatsim servers have been injected into FDR. 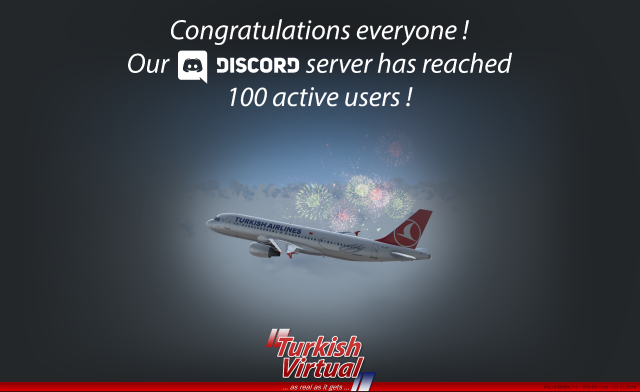 All vatsim data servers are now under the tracking of turkishvirtual.com main web site. If any of the vatsim servers are detected malfunctioning, then the web site will remove it from FDR's tracking list. If all servers are down, the FDR will not disqualify the flight until any of the servers is back online again. • The use of ''vatsim refresh'' button, which was being used by our pilots to refresh the vatsim data upon a flight plan crisis, but mostly used in an unproper way and in turn which caused the loss of the flight by a disqualify, has been restricted. From now on, the button will be disabled once the push&start phase starts. The system will refresh the data by itself once every 5 minutes. • FDR Vatsim menu is now showing the name of the vatsim data server which the FDR currently receives online flights data. Please report the name of the server if you continuously receive flight plan errors on a specific server (Please make sure your flight plan is correct before reporting). 28.10.2018 • LTFM (Istanbul New Airport) and LTSV (Sivrihisar Private Airport) have been added to the FDR's database. • FDR now allows you to take off with 1 degree flap configuration. • When the DOOR OFFSET of FSUIPC is triggered somehow (when the DOOR OPEN = TRUE state happens) at higher altitudes than 18.000 ft, FDR used to disqualify the flight with a ''CRASH BY SUDDEN DEOMPRESSION'' reason. It will not disqualify the flight anymore, instead, it will inject a decompression emergency and will expect you to descend under FL140 within 12 minutes (oxygen tubes discharge within 12 minutes). Besides, you will be expected to land at any airport within 35 minutes. If you fail to descend below FL140 or fail to land the aircraft within 35 minutes, FDR will penalize you. • The pilots, that are dealing with an emergency situation, will be shown with an ''EMERGENCY'' code on our website. • The Interphone Call window, that opens during the cabin crew's phone call to cockpit for reporting ''the cabin ready for take off/landing'', is now optional. If you don't want to see that window pop up, just go the main web page - crew centre - my FDR prefs menu, make the proper adjustments there. The conversation between the flight deck and cabin crew is not adjustable, you will continue to hear them whatever settings you will make. • You may now set your QNH according to the values published on your charts when departing from or approaching to high elevation airports. • Vatsim has a special procedure for the flights to LCEN (Ercan Airport - Turkish Republic of Northern Cyprus). On their flight plans, pilots have to report ''LCLK'' as destination and ''LCEN'' as divert airport, but FDR was not able find this flight report and as a result it was disqualifying the flight. Now, FDR has been coded to find the flight plan if filled up in accordance with Vatsim procedures. • FDR has a better evaluation coding regarding the Landing Light and Strobe Lights evaluation. Pilots may use their Landing Lights and Strobes during their backtracking or runway crossings. • From now on, the FDR will decide if the passengers are happy with the flight or not, so, they will applaud or not after landing, besides, the cabin crew will not ''thank the passengers for choosing the airline'' for example if the aircraft had survived a ''cabin decompression emergency''. • FDR will not anymore give penalty to aircraft in emergency which has landing gear down above 1.500 ft AGL when returning back or descending to an airport. • Some minor bugs fixed. 29.05.2018 • Turkish Virtual has been moved to secure servers and the website has gained ''HTTPS'' feature. FDR is now compatible to work with secure server. • ''Cabin Clear'' PA announcement has been moved to ''Interphone''. We thought it would be irrelevant to talk for a Turkish Crew in English on the interphone, so we made the conversation in Turkish, however, the conversation was reflected on the screen with subtitles in order to help our foreign virtual pilots to understand what's the topic of the interphone talk. 16.05.2018 • FDR can now be restarted without having to enter pid and password at the end of the flight. • FDR now will help you to bring your aircraft to the position of the last parked position if your last flight was one of ''charter'', ''event'', ''scheduled'' or ''assignment'' flights (you must use the same aircraft with your last flight's as well to use this option). • The XPlane's Flight Factor Airbus A320 airplane produces non constant offset values due to it's code infrastructure, and this unfortunately causes FDR to wrong evaluate the offsets, create unfair penalties as a result. Whatever we do with the codings of FDR, there is nothing to do about it, so we decided to prevent FDR to create penalties about lights, qnh and fuel imbalance when used with FF A320. • A new cabin announcement, (''cabin clear'') which is a real life practice, has been added to FDR. The timing of this new announcement has been implemented by the coordination with real life Turkish Airlines pilots. • Some minor unharmful bugs, which have never been noticed before, have been fixed. 20.01.2018 • FDR has been coded to comply with the new dispatch system of the web site. • TIME MODEs FDR has been implemented with a new system (which is called ''runway advisory system'') in order to minimize the conflicts about the selection of departure/arrival runways of airports which are not controlled by ATCs. The new system provides real life METAR and VATSIM METAR data as well as the real life status of the airport that the pilot intends to depart or arrive via the web site ''Flight Radar'' so that the pilot can determine which runway to use. • The previous captain announcements and cabin crew announcements have been replaced. • Security and welcome announcement timings during ''Boarding'', ''push/start'' and ''taxi to runway'' phases have been corrected. • Some minor bugs have been fixed. • The METAR report, which used to be provided during the ''Taxi to Runway'' phase, will be provided on ''Boarding'' phase. • The penalty, which was given if the NAV lights were ON when the flight report was being sent, has been cancelled. You may leave the NAV lights ON if you wish to fly again. 10.12.2017 • Throughout the last phases of a flight, some pilots were getting disqualified or crashed by some invisible scenery objects or by some other unlucky factors, now if the pilot makes a proper landing, then starts a proper taxi to gates, he will be able to send the flight report even if he gets disqualified or crashed. • Many problems that were encountered during the use of Xplane with FDR have been fixed. As of now, FDR will be able to behave differently to different simulator environments as well as different softwares (aircraft). FDR is now 99,5% compatible with Xplane. (Except the door recognition, even the Xplane can not open most aircraft's doors. • The error that was received when the vatsim menu button clicked soon after the boarding begins, has been fixed. • The birdstrike emergency situation, that was reported to be received on high altitudes, has been fixed. • Real world time setting is not the only time setting option anymore. Now there is also departure time based flights on which you can set your simulator time according to the scheduled departure time. • Throughout the last phases of a flight, some pilots were getting disqualified or crashed by some invisible scenery objects or by some other unlucky factors, now if the pilot made a proper landing, then started a proper taxi to gates, he will be able to send the flight report even if he gets disqualified or crashed. Pilots are now able to set the proper timing by the help of Time Sync button that has been added on the Final PreFlight Check menu. • Vatsim data controller chronometer error has been fixed. • If the pilot has filed a wrong flight plan, it will be marked with red lines and shown to the pilot so that the pilot sees where the error is. • The database of FDR, which consists of airports and runways data, has been enriched with thousands of new data. • There has been some new coding on OFP and Final Preflight Check Menus which would provide a more robust process. • Charter cargo flights are now available. You may see the further details during the use on FDR. • FDR now has a new seniority points calculation module which evaluates the state of ILS/VOR, day/night conditions, the length of the runway, the weight of the aircraft etc. • We have added some filtering options on the destinations menu. • Some unlogical codes which triggered the applauding of the passengers on some situations have been fixed. • FDR login time has been decreased down to 2-3 seconds from 30-35 seconds. 07.09.2017 • FDR is now fully compatible with p3d v4 64 bit version. • We have added a warning system for ''realtime cheat penalty'' on the ''Final Preflight Check'' menu which makes the final checks for FDR-Sim compatibility. By this warning, the pilot can now be aware of the fact that the real world time and the simulation time don't match each other. • When a pilot got disqualified or crashed, this situation used to be shown on the main web page as long as the FDR was kept open. From now on the ''disqualified'' or ''crashed'' states will be shown for 10 minutes maximum if the FDR is not shut down. • 4 ICAO code changes have been made on FDR and on the database of our website. These ICAO code changes had been implemented by Kyrgyzstan in 2013. 01.05.2017 • FDR is now fully compatible with Xplane Flight Simulator System. • It is now possible to take off with a full fuel tank even if the pilot do not use it all, FSEconomy program is now compatible with our VFR flights. • 10.000 ft callout will not be given anymore for VFR flights. • The reason of CRASH or DISQUALIFIED status will be sent to web site. • Boarding Complete announce will be heard on jetliner flights. 02.04.2017 • When there is a scenery problem on the scenery or on the mesh files, the airplane hoppings were sensed as take off- then landed just after the take off, the module that senses the flight status have been improved. • Time synchronization between the user's computer and web server has been redefined. 01.04.2017 • The systems menu (always on top), which could not be replaced on v5.00, can now be placed to another place. • Some minor changes have been applied to VFR flight logic. 26.03.2017 • After logging into FDR' a flight selection menu has been regulated to appear. Alternative Callsign's will be shown on the list thus in order to use it while connecting to Vatsim, the corresponding flight will appear early as a call sign. • Cargo flights are now available. Cargo flights previously were unable to take place however now are in the position of being able to select. Cargo flights are the same as the scheduled and assignment flights for which flights are compulsory with the selected model. Since the models available at THY used for cargo flights are only A300, A310, A330 ve 747F models; appropriate cargo routes have been defined. • Due to the nature of the cargo flights, the communication sounds between F/O and loadmasters have been edited. - At the point of ground contact with the wheels, having greater than 7 degrees of bank angle towards the left or right. - At the point of ground contact with the wheels, VS to be less than -700. - The doors opening whilst at an altitude of 18.000 ft.
- Not having contact with the ground even if a smooth landing took place with more than 5 nm distance between the closest airport. - Staying longer than 30 seconds in a situation of overspeed in the air. • A 10 second time intervention has been placed for overseed. Previously due to sudden wind changes; penalties were given at the point of overspeed, however now when overspeed occurs, any sort of penalties will not be given during the first 10 seconds. Penalties are given after the 10 seconds, and if within 30 seconds, intervention to the situation is not carried out and the plane is not saved from overspeed; then the plane will crash after 30 seconds. • Tailstrike penalty has been defined. During departure or taking wheels, whilst the wheels are still on the ground, if the nose of the plane lifts higher than 11 degrees; the tailstrike penalty is defined as the tail hits the ground. • The landing gear penalties have been suited to match the reality. Practically, landing teams can be dropped up to 280kts, in this situation a penalty will not be given. However, the gathering of the landing teams must be taken to 240 kts. Previously, landing it above 240 kts would of resulted in a penalty. • From Vatsim, during the obtaining of flight data and online atc/pilots data, some problems were encountered which resulted in the sudden freezing of the FDR. However now, it was fixed. • FDR has been upgraded as real world airline THY's taxi speeds have increased to 30 kts, therefore it has been agreed that for up to 30 kts taxi speeds will not receive a penalty. • With the previous versions of FDR, it was possible to open the programme at the same time many times, though now this problem has been fixed. • For those pilots that do not fly their assignment flights, a ''restriction'' practice has been put into place. If a pilot has more than 6 unattended task flights; this pilot will not be able to take part in the ''charter'', ''cargo'' and ''scheduled'' flights as these options will be shut and only the task awaiting for the pilot will be available to take part. The pilot then has only the option of carrying out the assignment flight. The pilot for his first assignment on the list will be able to use ''business ticket'', ''free jumpseat'' or FDR's own offer of a flight, any other flight options will not be available. - During boarding, any form of assessment will not take place. - Pushback or with directly engine start-up, Landing Lights (LL) and Strobe must be OFF. - NAV and BEACON must be on during pushback or direct engine start-up, till the engines are shut; it must stay ON. - Prior to entering the runway, LL and Strobe line up must be turned ON. During line up, from the moment the captain announcement begins, if it has not been switched on already and is switched on within 5 seconds; a penalty will be not be given. • All the flight models presented to the FDR have had the maximum passenger capacity defined. Thus as previously done, carrying absurd amount of passenger numbers have been disabled. • Heavy planes including B777 and B747's flap penality limits have been redefined. A penalty will not be given as long as the flap limits have been complied to, given by the QRH along with the plane. WARNING: It is recommended one does not come within the reach of these limits till the end. For example, 1 degree flap opening for the B747 is maximum 280 kts. Against the possibility that the FDR values do not coincide with the smaller values of the software, it is always recommended that 6-7 kts is left as a safety margin. • Changes have been made to the plane lists on our home web page (www.turkishvirtual.com). Now as status: Boarding - Push Start - Taxi Rwy - Take off - Departing - Enroute - Descend - Approach - Landed - Taxi Gates - Shutdown statuses will appear. The same statusâ€™s will be shown within the FDR. • THY's favoured ''captain announcements'' has also been reflected onto our system. The planes captain pilot can announce to passengers both during taxi mode and shortly after departing. • After landing, the touchdown VS - Landing rate that everyone is curious about has been reflected onto the FDR's information boxes, and will appear till shutdown. • Any penalties that arise by FDR during a flight, can be identified by the pilot. However, this situation can only be seen by an authorized person. Penalties given by the FDR will be closed at the end of the specified period for the purpose of training more new pilots in order to track the time at which stage and how they are taken. These penalties can be requested by the management. - Bird Strike: this has been programmed to prevent a bird hitting a motor at any time during lift off and landing during AGL 2000-6000 ft. After landing, the pilot will not receive a divert, fuel or flap penalty. - Passenger Emergency: After completing 40% of the flight, up until 55%, you will be informed of a passenger emergency, and the pilot will be expected to land in their chosen area within 35 minutes. The pilot will be able to see the remaining time left to submit the flight report. If the pilot fails to do so, this will result in the passenger losing their life, and at the end of the flight will receive a -100 penalty point. After landing, a divert penalty of below 10.000 ft, 250 knt overspeed and fuel penalty will not be given. This emergency situation might occur only on assignment and scheduled flights. If the flight takes longer than 2000 nm, it will not occur. 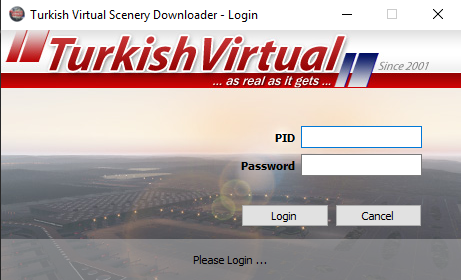 • Administration have made a decision that during group events organised by Turkish Virtual, FDR may only allow flights to specific destinations chosen for the event. 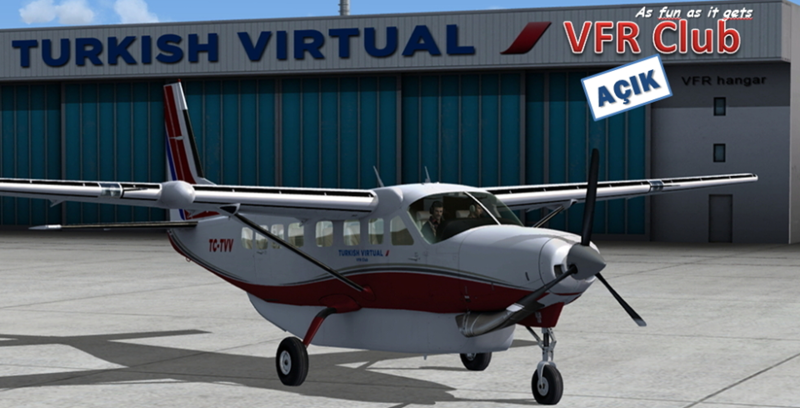 • From now on, our pilots will experience VFR flights to be more realistic on terms with FDR. If the flying plane is of FDR and has less than 25 passenger capacity; this flight will be accepted as a VFR flight. VFR flights: will not apply real time penalties, at departure - flaps will not be sought, reverser will not be checked, bank angle status will not be looked at, landing evaluation will not be made, for the last 100 feet - stall status will not be checked, instead of 6 passengers, 2 will be looked for, and instead of jetliner announcements, a suitable voice from VFR will be used. • in possible penalty situations, please do not think that FDR is giving wrong solutions. FDR receives data from FSUIPC at least 10 times per second. The data received is completely via FSUIPC and not created by FDR. Therefore the evaluation criteria is completely made according to FSUIPC data. FDR penalty criteria is tested from 100's of flights and it has been 100% verified that errors have not been found. Instead of claiming that FDR had made an error - please try to find out where you've made a mistake. Everyday there are many flights being made without getting any penalties. Any problems regarding this topic can be questioned through the forum or Facebook in order for improvement. • FDR reads many data from FSUIPC. This data is the standard OFFSET evaluation gained from the FSUIPC's FS world. Within the FS world, many external programs use this standard offset (variable). For example, IAS value in all flights over FSUIPC has 4 byte value with 02BC read with an integer variable offset. As long as all flights or flight record programs use this variable, within the FS world; any program will be able to be used with any plane. However, some plane software firms use their own local variables (LVAR) instead of the standard offsets. In this case, some programs will experience problems with some planes. For example, the PMDG 738 planes for STROBE value has used standard offset instead of the LVAR. For this reason, FDR, PMDG 738 planes does not recognise strobe. Similarly, Aerosoft, Airbus softwares BEACON variable has not used the standard offset. In this case, the biggest problem is experienced with the FSLABS firm Airbus A320 plane. Many offsets are not used. This situation has given rise to suitability problems with the FDR. The solution to fixing this problem for all the planes excluding the FSLABS A320 is with the FSUIPC simple key assignments. In order to do this, a registered FSUIPC is required. For example, to overcome the PMDG Strobe perception problem, below the FSUIPC keypresses menu, choose the toggle strobe option either by the keyboard or the joystick, assigning a key to this option and whenever the option STROBE ON/OFF is required; by clicking that assigned key to toggle through - a problem will not be experienced. However, to overcome the FSLABS A320, other methods may be required. To fly with the FSLABS A320 â€“ the required procedures will be presented within this packet. • FDR does not allow for offline flights. From the moment Pushback begins, if you cannot connect to the VATSIM servers or if you do connect but cannot obtain a valid flight plan - every 5 minutes, you will receive a warning, on the 6th warning; your flight will be disqualified. Only being connected to Vatsim and just sending any flight plan is not enough. Callsign must begin with THY (For example: THY1234 or THY2AB). Your flight plan will not be accepted if you have received a Callsign that does not start with THY. Your flight plan must have at least 3 words. Your departure location's ICAO code and landing location ICAO codes must be the same as the flight you have selected. If the plan cannot be found ''plan not foun'', and if found but has errors ''error on flight plan'' warning will be received. Throughout the flight duration, you must ensure that there is connection available for both your planes internet connection and Vatsim connection. The Vatsim connection can be checked by clicking the refresh button bellow the Vatsim menu. However, as of a pushback - if a plan is not found each time after a refresh; the tolerance of 5 amounts would be reduced by one. • This flight record programme has taken real life flights into account to make your FDR flights to a specified discipline. It is recommended to gain pleasure rather than do speed. The penalties given via the FDR should not be made a problem. Cancelling flights or not carrying out any flights at all due to the concern of getting a penalty will only prevent you from enjoying your time. With FDR's aim of having flights suitable for everyone and every pleasure; you can have very enjoyable flights very close to realism in many different ways. 11.11.2016 • Due to a problem on Vatsim, the Vatsim Data and Flight Plan information's that weren't showing through FDR and website have now been fixed. • A few FDR v4.18 crash problems have now been resolved with FDR v4.19. 01.11.2016 • After the new changes, Flight Recorder (FDR) v4.18 is now compatible with Prepar 3D. • Also, LTCW-Hakkari/Yuksekova, LTCU-Bingol, LTCV-Sirnak and LTCB-Ordu/Giresun airports have been added to FDR v4.18's version. 22.01.2013 • Active Flights, Flight Watch, Flight Report & Schedule Maps had been modified to show actual flight path flown and planned VATSIM route. • Active Flights & Flight Watch system is now showing real time flight information with a maximum latency of 15 seconds. 14.01.2013 • Initial release of Turkish Virtual WEB Site v4. Online flight map added to homepage. • Online flight watch function added to homepage.